Any household with either young twins, or two or more children under five, is bound to be a hectic one, especially when it comes to hitting the road or heading out on errands. Even if they’re suspiciously compliant, you never seem to have enough hands free to grapple with everything the day throws at you. Sound familiar? Well, we’re not promising we can make it easy, but with our list of the best double pushchairs behind you, we at least hope we can help you to find the buggy that’ll comfortably corral your little ones and carry your goods (including that all important changing bag) all day long, without getting stuck on corners or in deceptively narrow doorways. When it comes to travelling with two children at once, there are two main types to choose from: tandem buggies, where the seats are staggered and one sits in front of or above the other, and twin buggies, where they sit side by side. Many tandem pushchairs have a newborn-friendly back seat and one up front for toddlers and older babies, and adaptable models with click-into-place seats also offer a smooth ride for toddler and newborn alike. As such, they’re the best for growing families of staggered ages, but not suitable for twins. For them, the tellingly named twin pushchair is the best type of pushchair for twins. Keep an eye out for your favourite brands featuring in our list of the best double pushchairs; you'll notice high end brands such as iCandy and Bugaboo, but also some brands with slightly more accessible price points which won't break the bank but offer equal comfort. Always ensure you know the brand you are buying from, in many cases, the additional pushchair covers and accessories will only be compatible if there are the same brand as the buggy, something to consider if you are on a budget. Check out our guide to the best double pushchairs and buggies for your growing brood below. This Made for Mums 2017 Gold award-winner is, quite simply, a triumph of engineering. It converts from a single to a tandem using a converter seat (from 6 months), so your growing brood can take to the road side by side. Seat elevators mean that baby can be brought closer to you, and that the buggy can double up as a high chair for use in restaurants. Plus, universal car seat adapters allow a travel system to be installed to the pushchair chassis. At under 11kg, this dynamic duo from Joie might be one of the best lightweight double pushchairs available, but that’s not the only thing that makes it friendly for a single pair of hands. It also folds down smoothly until it’s compact enough to fit in even the most bijou of car boots, stands up when folded (no leaning necessary), and, best of all, it only takes one hand to do it. This sporty little number is that all-too-rare thing: one of the best double jogging buggies for active parents of twins or two young children. It boasts 16-inch wheels with pneumatic tyres and a lightweight aluminium frame for all-terrain action, making even running on grass and leaves relatively easy — no mean feat with two small humans in tow. Meanwhile, the handlebar-mounted brake lever easily controls speed and the distinctive front wheel keeps the whole thing stable for safe and comfortable carriage. 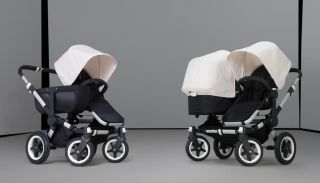 This minimal and elegant twin stroller is wide enough to offer continual comfort to its two tiny passengers, but not so wide that it’ll hamper movement or compromise on manoeuvrability. The sleek stay-clean wheels have lockable fronts for straightforward striding, but swivel when needed for tricky corners, and while this isn’t the most lightweight buggy on our list, it’s still a great model for travel, folding down small and offering a convenient carry handle. This flexible model adapts, with a few simple clicks, into mono, duo, or twin mode to suit all sets. However many seat units you attach, the independent reversing and reclining features mean that you can rest assured your little ones will be comfortable in them, whether wide awake, relaxed, or fast asleep. The air-filled multi-terrain wheels deal with changes of surface easily, and the included storage makes it one of the best buggies for shopping trips and storing all those baby essentials. The footmuff, head hugger and shoulder pads included in this model make it a snug and comfortable choice for transporting two babies at a time. The extra-wide multi-position reclining seats put them in the lap of luxury while on the move, and the parent viewing window in the extendable hood means they never lose sight of you. Plus, the light aluminium chassis makes it super easy to manoeuvre. Uniquely, this best customisable tandem offers the opportunity for constant company, with the option for both seats to face you, face forward, or even face each other. Whichever way they’re looking, they’re assured of a smooth ride, with the Zoom Style’s lockable front swivel wheels — easily locked and unlocked with one foot — offering stability and smooth manoeuvring wherever you are. The kaleidoscopic design of this eye-catching double is a big selling point, of course, but there’s so much more it can do. Its seats boast a cosy footmuff and kangaroo pouch for keeping hands and feet toasty warm, and a supportive head-hugger and cuddle nest for newborns in the back. But even while delivering double, the Shuffle is reasonably compact, with its umbrella fold with autolock and convenient carry handle offering easy transportation. With its wheelbase measuring the same as that of a single buggy, the Mountain Buggy Duet deals with narrow doorways and navigates packed pavements with ease, but doesn’t compromise on sturdiness. It breezily accounts for the extra weight of two children, with a hand-operated control brake and swivel front wheels with the option to lock, and folds down with just one hand when it’s time to hit the road. Liked this? Read our guide to the best bugaboo strollers here.